Are you thinking of moving to Parkstone? When choosing a removals company for moving to Parkstone, Maidmans Moving & Storage are industry leading, award winning, professionals, offering high quality home moves along with exceptional customer care. 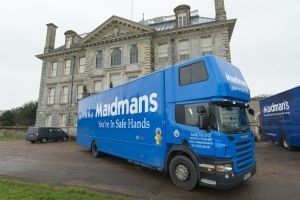 Maidmans Moving & Storage has an outstanding customer service record with clients moving to or from the Dorset area. As a British Association of Removers member, we follow the code of practice approved by the Trading Standards Institute. You will be using the UK’s first company to attain all three BSI quality standards for domestic removals, commercial removals and storage and with 40 years of experience; we go the extra mile! Whether you need a local, long distance or international move. Every job is tailor-made to your particular requirements; we work with you every step of the way, solving your problems and keeping you informed. If you prefer to pack yourself, we can deliver packing materials. For total assurance, leave it all to our packing service. Our full-time, fully-trained, employees take personal responsibility for your possessions. Are you moving to Parkstone? During February 2015 the average house asking prices were £389,000, You could buy a semi-detached property for around £290,000; smaller Victorian terraces for £275,000 and a family detached home from £559,000. During July 2017 the average house asking prices changed to £284,000, You can buy a semi-detached property for around £263,000; smaller Victorian terraces for £224,000 and a family detached home from £421,000. In September 2018 the average house asking price is currently £311,000, You can buy a semi-detached property for around £284,000; smaller Victorian terraces for £271,000 and a family detached home from £396,000. Source Zoopla. The average house asking price in Parkstone during April 2019 has changed and is currently £319,000, You can buy a semi-detached property for around £292,000; smaller Victorian terraces for £276,000 and a family detached home from £405,000. Source Zoopla. Parkstone has 3 rail stations within 2 miles, Parkstone Dorset 0.5 miles, Poole 1.4 miles and Branksome 1.6 miles. If you’re looking to fly then Bournemouth Airport is only 6.5 miles away. This domestic removals item is brought to you by www.maidmans.com the removals and storage company serving Parkstone, Poole, and the surrounding area. This service is aimed at people moving in Parkstone and for those looking for a local removals, storage and shipping company. If you are looking to move to the Parkstone area, Maidmans Moving & Storage have been providing a removals, packing and storage service for over 30 years and are members of the British Association of Removers.